Week 9 of the 2017 NFL wagering season is heading straight towards us and it’s filled to the brim with gambling opportunities. 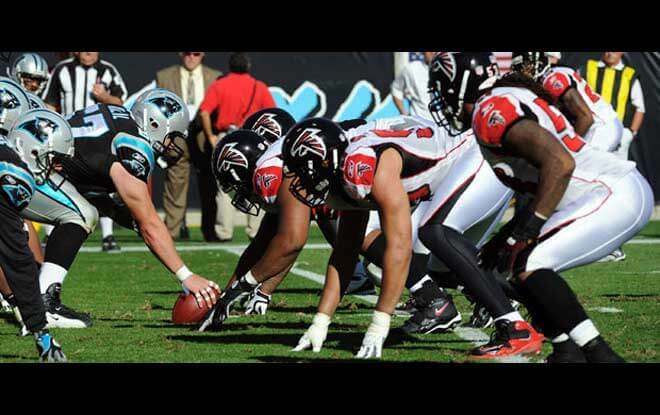 One of the most intriguing matchups of the weekend has to be this Saturday’s pairing between the Atlanta Falcons and the Carolina Panthers. As most sportsbook US players know, the NFC South currently belongs to the 5-2 New Orleans Saints. So this Sunday’s divisional rivalry will be to determine who the frontrunner to challenge the Saints in the division is. Let’s take a look at which team NFL gambling sites are predicting will come out on top. The Falcons fly into this Week 9 matchup sporting a 4-3 record that ranks them 3rd in the division. Being the reigning NFC champions, Atlanta was hoping to build on last year’s Super Bowl run. However, it might be too soon to tell, but most sports betting sites have a growing feeling that Matt Ryan & Co. are experiencing a classic case of a Super Bowl hangover. Heck, if there’s one team in league history that has a justifiable SB hangover it would have to be the Falcons, considering the embarrassment they suffered by giving up that infamous lead. The Falcons are coming off a narrow 25-20 win over the New York Jets that snapped the 3-game losing streak Atlanta was dealing with. Those who have been watching the Falcons this season know that they don’t resemble last year’s squad, and that’s on both sides of the ball. Atlanta’s offense is having a hard time matching the precision and consistency of the 2016 team. The biggest giveaway to this is Julio Jones’ stats for the year. Last year, Jones was able to rack up over 1,400 yards receiving, and that was in 14 games. This season, through 7 matchups, Jones has struggled to reach even 600 yards. Since Jones is the Falcons’ ace receiver, this is a telltale sign that the Falcons’ offense is struggling. The Panthers pounce into this weekend’s contest with a 5-3 record that ranks the franchise 2nd in the NFC South. Early on in the season, Carolina looked like they were poised to make a Super Bowl run. After the Panthers posted a 4-1 record through their first 5 games of the season, most sports betting sites felt like they had a real shot of winning the NFC. However, after that praiseworthy start, the Panthers suffered a brief setback, conceding back-to-back losses. The most alarming of those two was the last; a 17-3 defeat to the Chicago Bears. The Bears are far from what you’d consider an elite franchise, given that their last in the NFC North – a division where 2 teams are contending with backups. But the Panthers were able to regain some momentum with their recent 17-3 win over the Tampa Bay Buccaneers. Furthermore, most NFL betting players will be picking them over Atlanta. The Panthers have an elite defense, a big turnaround from what we saw defensively out of Carolina last season, but their offense is far too inconsistent to bet on this team in the long run. This week, before the trade deadline, we saw Carolina trade away Kelvin Benjamin to the Buffalo Bills for a couple of draft picks. Benjamin was arguably Cam Newton’s favorite target. However, it’s pretty clear that the Panthers felt they would be better off trading him away and investing in other players. Considering Benjamin’s size, above-average weight, age, and low-ranking in terms of separation created during route running, the move isn’t all that bad.